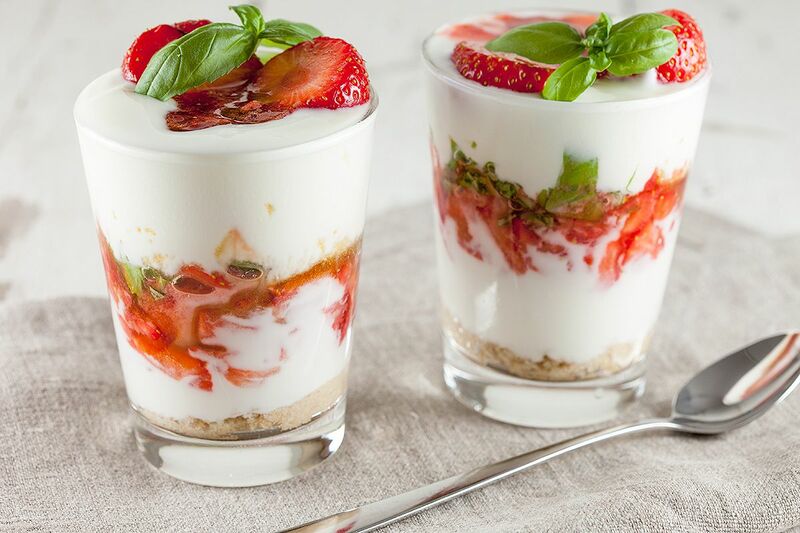 Simple, every weekday strawberry yogurt dessert. Ready in about 10 minutes, recipe for 4 people. It's sweet, bitter and perfect for after a heavy meal. START by cleaning the strawberries and removing all of the tops. 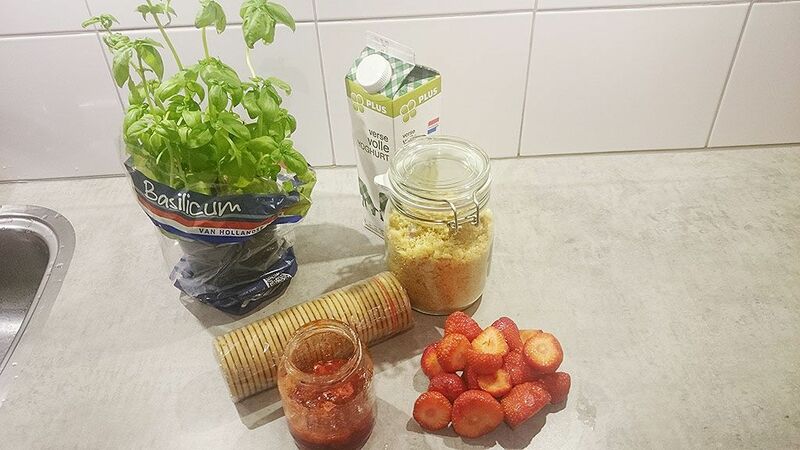 RINSE and clean the fresh basil leaves, since this recipe depends on how sweet the strawberries are; use as much as you think would be necessary. ROUGHLY chop up the strawberries and set aside for now. ADD the dry biscuits along with 2 tablespoons brown sugar into a zip-loc bag, crush them using a heavy object such as a rolling-pin. GRAB four clean glasses, start by filling the bottom with crushed biscuits. 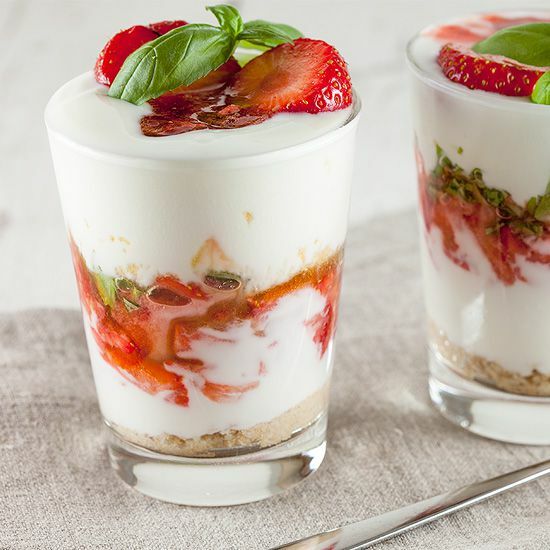 POUR yogurt, then add in some chopped strawberries. TEAR up some of the basil leaves, add into the glass. 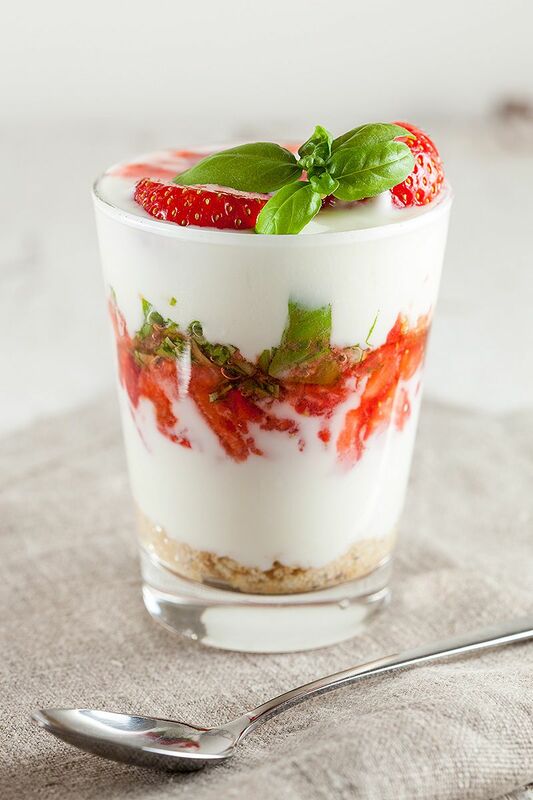 CONTINUE filling each glass to the top with more yogurt and basil leaves. Top it off with a nice scoop of strawberry jam. Enjoy! It looks wonderful. I made a strawberry basil cake a few months ago and found the combination amazing, I never would have thought to use basil in cake or dessert before. I can therefore imagine how great this tastes. Ow yes, that strawberry basil cake, mmmmm! Just thinking about it makes us want to have it again right now! As dessert or for breakfast, we love fruits and yogurt together. Your photos looks gorgeous, too! Lemon and nettle ! I made a lemon and nettle cake by steaming and chopping the nettles then incorporating them into a cake batter with the rind of three lemons and juice of two lemons… bake at 170 for 40 mins .